Disclaimers: these are all fiction and only one was published in 2014. This is, no contest, the best book I read in 2014. 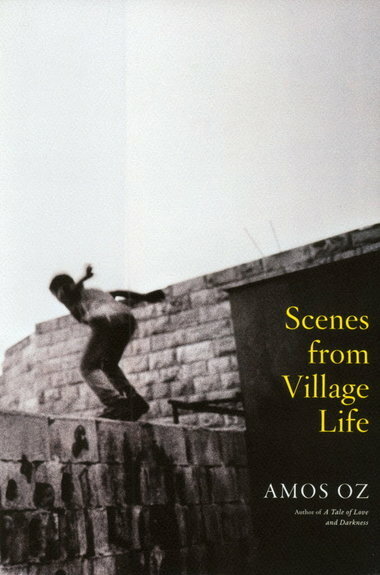 It is a collection of linked short stores set in the fictional village of Tel Ilan, a short drive away from Tel Aviv. The stories are poignant, haunting and absorbing. They are translated seamlessly by Nicholas De Lange—you are never aware that you are reading a translation. Characters featured in one story appear in others, perhaps only very briefly, but helping to create a whole, nuanced world. My favourite story was Digging. Pesach Kedem, an aged former member of Knesset, lives with his widowed daughter, Rachel, and their lodger, a young Arab student. Each in turn hears digging under their house in the middle of the night and consequently becomes obsessed and suspicious. There is no physical explanation for what they hear—the house is close to a cemetery, but surely they don’t dig at night?—so we are left with the sense that in a small Israeli village suspicion and the fear of the unknown pulse constantly just below the surface. These are short stories with a bite—a brilliant, disturbing collection. The dystopian world of Escape from Spiderhead was hard to read but impossible to look away from. Jeff is participating in some dubious behavioural experiments as a way of getting out of doing time in jail. Abnesti and Verlaine are conducting the experiments and are able to keep their emotions at arms’ length because they are just doing their jobs. It is clever and chilling. In Puppy, Callie is trying to take care of her damaged son, Bo, placate husband Jimmy, and pass on an unwanted puppy to a nice family who will take care of him. But the nice family is horrified at Callie’s environment and the result of their visit will be disastrous for more than the puppy. This is a big book full of ideas: Buddhism, mysticism, philosophy, and aspects of Japanese culture both old and very current. The chapters alternate between a period in the life of Ruth and her husband Oliver on Cortes Island in the Pacific Northwest, narrated by Ruth, and the life of Nao and her family living in Japan, told through Nao’s diary entries. Ruth and Nao have a connection only partly explained by Ruth’s having acquired Nao’s diary. 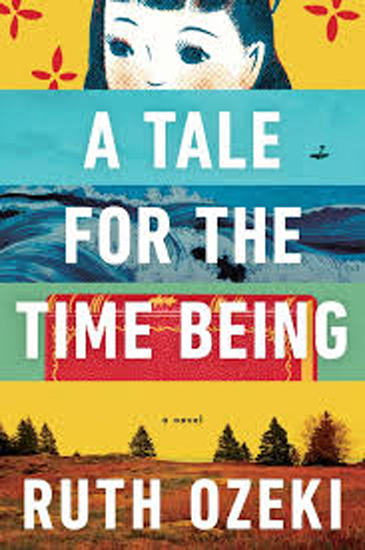 It’s a lavish, sprawling sort of book: as you get deeper into the story, Ozeki crams more and more interesting stuff into it and because I am a certain kind of reader I wanted it to be shorter, a little more contained and less self-indulgent. But there were a lot of threads to follow elsewhere (this book generated a lot of online searching and conversations with others) and the ending was neither left hanging nor wrapped up too neatly. 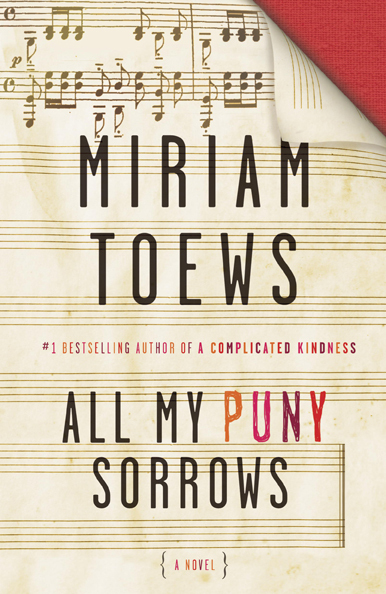 It’s hard to imagine how a story about a suicidal sister could hold such a lot of humour, but Toews has the ability to combine comedy and tragedy in the way that we sometimes laugh at funerals—not keeping death at bay, exactly, but accepting that life and death are all mixed up together. Yolanda (Yoli) and Elfrieda (Elf) are sisters whose early lives are dominated by the disapproving elders of their Mennonite community. Elf is a talented pianist but the elders are opposed to her having a piano. Our little Mennonite town was against overt symbols of hope and individual signature pieces. Our church pastor once accused Elf of luxuriating in the afflictions of her own wanton emotions to which she responded, bowing low with an extravagant sweep of her arm, mea culpa, m’lord. Back then Elf was always starting campaigns. She conducted a door-to-door survey to see how many people in town would be interested in changing the name of it from East Village to Shangri-La and managed to get over a hundred signatures by telling people the name was from the Bible and meant a place of no pride. As an adult, Yoli is trying to prevent Elf from killing herself while struggling with the paradox that loving Elf might mean the ultimate sacrifice of helping her to end the life that she finds intolerable. Although Yoli’s life as a single parent is chaotic, she has a strong core of character and determination. Elf is a much-in-demand concert pianist with a loving husband and what others might see as an enviable life but she doesn’t want to live. There are other characters in this novel—their parents, Elf’s husband, her manager, hospital staff, Yoli’s children—but they recede into the background and the relationship between the two sisters is the main event. 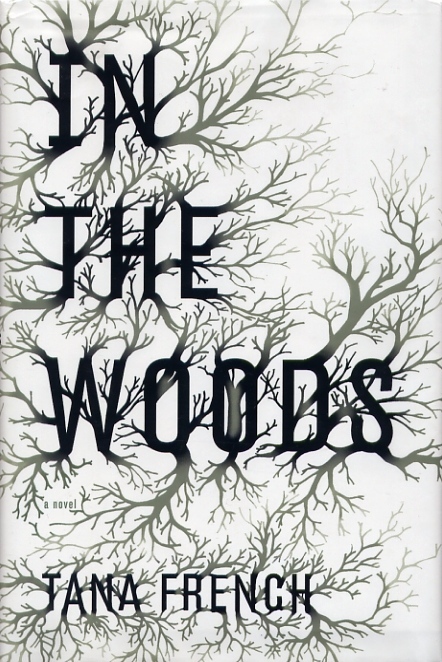 Irish author Tana French was a welcome discovery in 2014. She writes an unexpected kind of crime book: a police procedural that equally qualifies as literary fiction; crime fiction where you don’t necessarily get answers to questions; a story with more shadows than light, where you can’t trust anyone. What I warn you to remember is that I am a detective. Our relationship with truth is fundamental but cracked, refracting confusingly like fragmented glass … What I am telling you, before you begin my story, is this—two things: I crave truth. And I lie. Ryan’s early childhood and his life as a detective merge when he is assigned with his partner Cassie Maddox to a crime whose location brings back unsettling childhood memories. Of course, he should find a way to excuse himself from the case—and of course, he doesn’t. But that is the last predictable moment in the story. 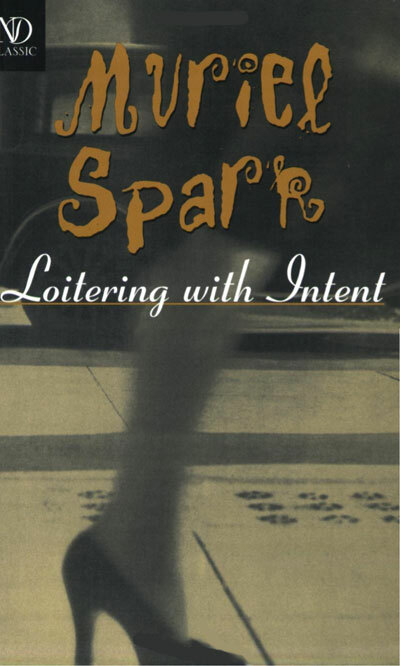 Read Muriel Spark’s Loitering with Intent. Spark’s books are odd, though usually delightfully so. Loitering with Intent is high on the quirky index but has a well-thought-out structure that gives you the sense of more layers than meet the eye. Not only had I read Sir Quentin’s fabulous lists of Who was Who among them, but I had also read the first chapters of their pathetic memoirs, and through typing them up and emphatically touching them up I think I had begun to consider them inventions of my own, based on the original inventions of Sir Quentin. Now these people whose qualities he had built up to be distinguished, even to the last rarity, came into the study that calm and sunny October afternoon with evident trepidation. Sir Eric was a small, timid man. He shook hands all round in a furtive way. I supposed rightly that he was the Sir Eric Findlay, K.B.E., a sugar-refining merchant whose memoirs, like the others, had not yet got further than Chapter I: Nursery Days. The main character was Nanny. I had livened it up by putting Nanny and the butler on the nursery rocking-horse together during the parents’ absence, while little Eric was locked in the pantry to clean the silver. Fleur knows right away that she will have some disagreements with Sir Quentin’s housekeeper. Beryl, Mrs. Tims (according to Sir Quentin’s observation of the niceties), or Mrs. Beryl Tims, as she prefers, is protective of Sir Quentin, annoyed by his mother, Edwina, and rather hostile to Fleur. Fleur categorizes her as the English Rose type, which is apparently not a compliment. In her spare time, Fleur is working on her novel, Warrender Chase. As the novel progresses, Fleur finds that its events are being reflected in the lives of the members of the Autobiographical Association. This sinister development goes along with a feeling that Sir Quentin, Beryl Tims and Dottie (the wife of Fleur’s sometime lover) are working together to prevent Warrender Chase from being published. As a “woman and a writer in the twentieth century,” and a rather independent-thinking character, Fleur manages eventually to outwit them all and to become a published author. 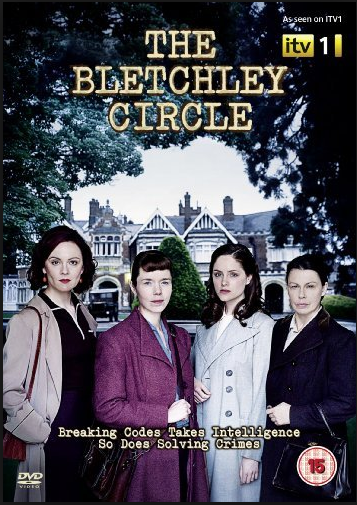 The Bletchley Circle is a three-part series, made for ITV and airing in 2012. Again, it’s about women with minds of their own living in an era when there were fewer opportunities for them to flourish (none of the comedy of Loitering with Intent, though). The four women of the Bletchley Circle were code breakers during the Second World War. After the war, they—in the main—returned to occupations more traditional for women. Susan (Anna Maxwell Martin), the central character, becomes a full-time wife and mother. However, when a serial killer preys on women the group reunites to resurrect their dormant skills in an attempt to find the murderer. Each woman brings a particular quality. Susan is the main discerner of patterns; Lucy (Sophie Rundle) has photographic recall; Millie (Rachael Stirling) is the mathematical one, and Jean (Julie Graham) has connections and can obtain confidential information. The emphasis on finding patterns makes sense and foreshadows the geographic profiling and psychological profiling used in police work today. Of course, Susan’s initial approach to the police with her findings is discouraging. Attitudes of the era could be very patronizing. The women have to take matters into their own hands and take risks before the killer is finally found. 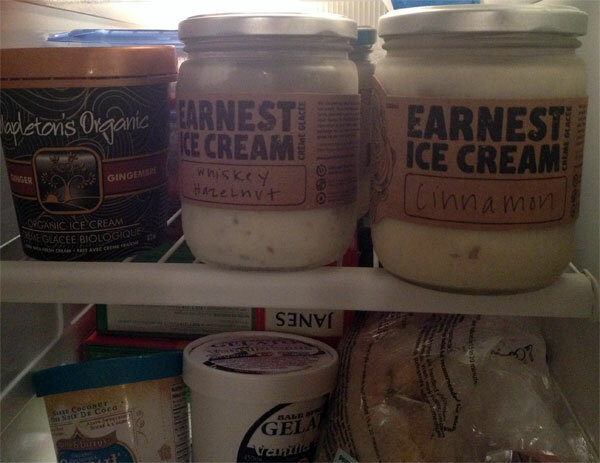 Earnest Ice Cream (earnesticecream.com) is simply the best. I am currently enjoying Maple Walnut, Whisky Hazelnut, and Pumpkin Pie in rotation. The store is on Fraser Street in Vancouver at East 24th Avenue. 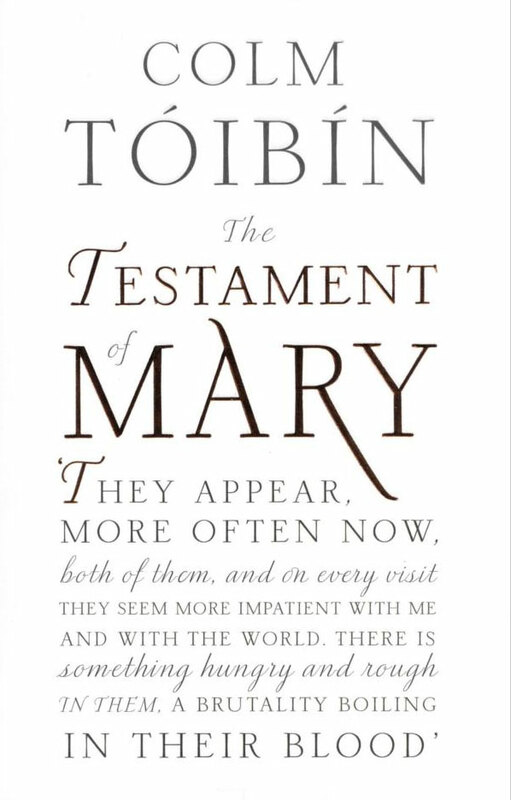 Read The Testament of Mary, by Colm Tóibín. The concept is compelling: in her old age, Mary, the mother of Jesus, is hounded by two groups of people—some, including the Romans and the Elders, who want her silenced in case she contributes to the growing legends about her son and some, her keepers who are writing the Gospels, who want her to tell stories about her son’s divinity. He gathered around him, I said, a group of misfits, who were only children like himself, or men without fathers, or men who could not look a woman in the eye. Men who were seen smiling to themselves, or who had grown old when they were still young. Not one of you was normal, I said … My son gathered misfits, although he himself, despite everything, was not a misfit; he could have done anything, he could have been quiet even, he had that capacity also, the one that is the rarest, he could have spent time alone with ease, he could look at a woman as though she were his equal, and he was grateful, good-mannered, intelligent. Mary relates in a puzzled, angry way the various events that led to people’s believing that her son was the son of God. In her view, things got twisted, embroidered, exaggerated. She doesn’t understand how some of the supposed miracles came to happen and she often just sounds exhausted. Towards the end of the book, Mary talks about the crucifixion. Related by a mother, it could hardly not be a harrowing story but in addition Tóibín seems to catch the very nature of evil through the quiet words of the witness. 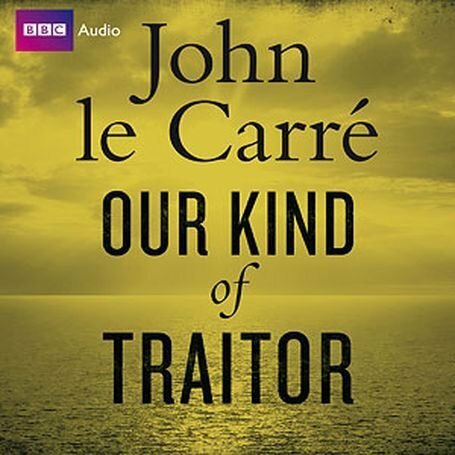 As John Le Carré is one of the best of his kind. As an author of novels of intrigue, I don’t think he has an equal. His early spy novels were classics of their era; in recent years his work has had to be updated to reflect the changing world, but he retains an unparalleled ability to reflect the moral complexity around us. The book takes its time setting up the background and fleshing out the characters. Perry and Gail are the least interesting, although we get to hear a lot about their lives. More nuanced are the characters of Hector Meredith and Luke Weaver, the intelligence officers who work on the case. There is a sense of growing menace and despair at the uphill work they have to do to put together a plan. The conflicting loyalties and dubious morality of the grey, faceless men that Hector has to work with are all too convincingly portrayed. You watch as greed for political power or influence or money create a climate where the unthinkable becomes banal reality. You know it is not going to end well but you’re unable to look away. 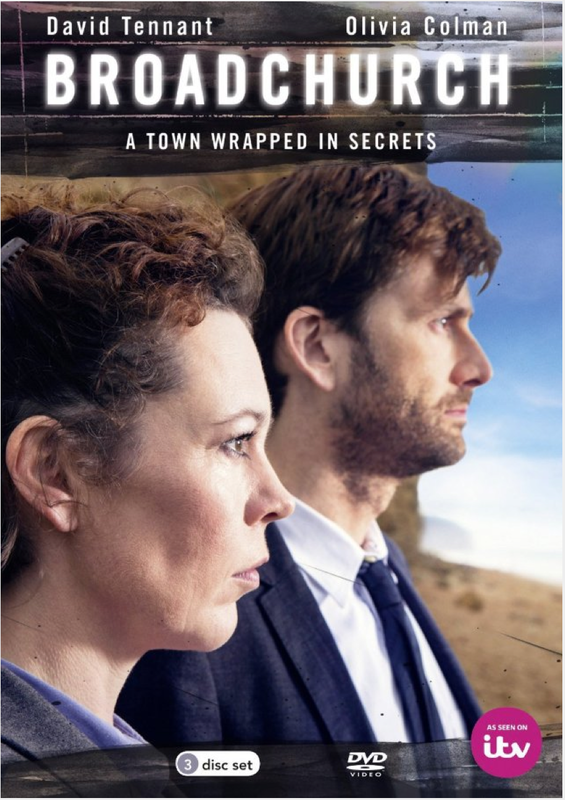 Broadchurch, an eight-episode BBC TV series starring David Tennant as Detective Inspector Alec Hardy and Olivia Colman as Detective Sergeant Ellie Miller. This series, set in a village on the Dorset coast, is the compelling story of a child’s murder and the subsequent investigation that involves and damages the whole community. Ellie Miller is the heart of the series, having a person-next-door quality that makes her character utterly believable. She is deeply affected by the murder as she is a close friend of Beth and Mark Latimer, whose son Danny has been killed. Ellie believes that her son Tom is the victim’s best friend, although it later becomes clear that their relationship is much more complex than that. As with all the best murder mysteries, everyone in the community has something to hide. Their prevarications and suspicious behaviour may hold important clues—or may just lead to dead ends. Ellie is annoyed that DI Hardy has been brought in to lead the investigation since she believes the job was promised to her. Compounding her annoyance, Hardy obviously has personal problems that are having an impact on his ability to do the job. For his part, Hardy is annoyed that Miller can’t set her personal feelings aside. The identity of the murderer only becomes obvious close to the end of the series. As the truth sinks in in the final episode, the actors have some harrowing scenes that ring true. And the murderer has a motive that is not easily classified—there is an ambiguity about it. The series is an impressive achievement. Postscript: Since US television cannot leave well enough alone, Fox will be developing an American version of Broadchurch, to air in 2014-15. 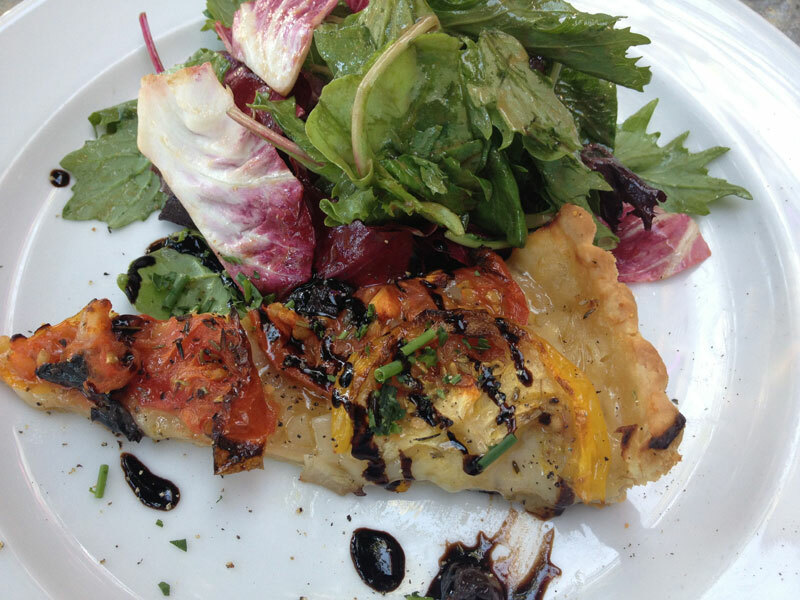 Heirloom tomato tart at Provence Restaurant in Point Grey, Vancouver. Eating on the patio, shielded from the street by hanging baskets. A perfect summer evening! 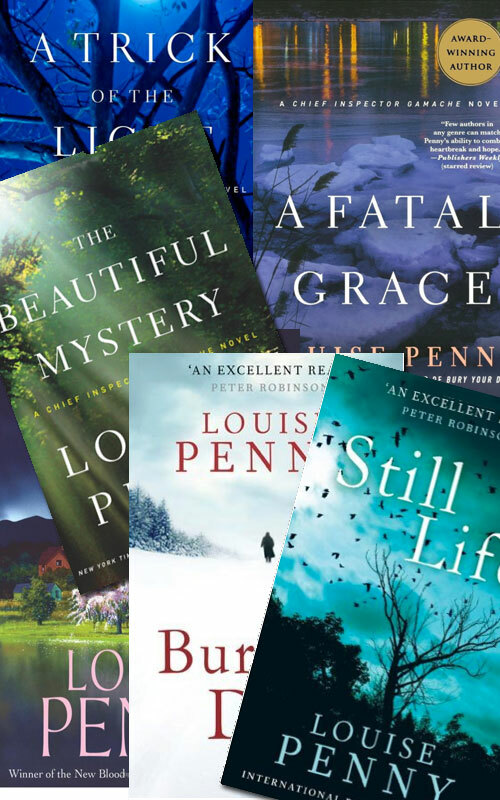 The Beautiful Mystery, A Fatal Grace, A Trick of the Light, Bury Your Dead, and Still Life by Louise Penny. Yes, I am reading them in the wrong order. This adds a certain something to the experience of reading Penny’s Armand Gamache books. While they are definitely mystery novels, they don’t have the increasingly ugly violence that has come to define mysteries in recent years. There is a murder but no undue emphasis on gory details. Instead, the story is about Gamache’s investigation. He focuses on what people say and how they say it in the aftermath of the crime. He uncovers the relationships between people—he watches how they interact and files away all those little things that will help him solve the case. Many of the novels are set in the Quebec village of Three Pines. This is a picture-perfect village, with the resident characters—mostly charmingly idiosyncratic people—walking their dogs, talking, quarreling, socializing, and of course eating. Food is a constant theme throughout the Three Pines books. Gamache does not go long without stopping for a café au lait and a croissant. Or a freshly baked crusty baguette. Or a microbrewery beer. Sensual pleasures are all around. Jean-Guy glanced around. The bistro was quiet. Placing his hands on the arms of his chair he hauled himself forward. The chair felt warm from the fire. In the grate the large logs popped, sending embers bouncing against the screen to glow on the stone hearth than slowly die away. The maple logs smelled sweet, the coffee was strong and rich, the aromas from the kitchen familiar. The first Penny book I read was The Beautiful Mystery, set in a Quebec monastery. Gamache and Jean-Guy Beauvoir, his second-in-command, are investigating a death in the monastery, although their previous experiences continue to haunt them there and an unwelcome visitor from outside further complicates matters. Nevertheless, Gamache maintains his courtly demeanour and demonstrates integrity in the face of all challenges. 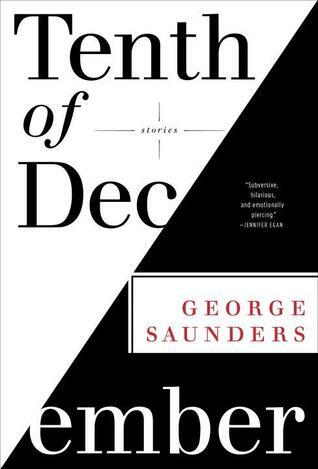 Beauvoir is a more volatile character, who rushes in where Gamache would hold back—both verbally and in person. So then I went back and started jumping into the other books. This piecemeal approach means I am putting together the overall history in a patchwork way, but it doesn’t seem to affect my enjoyment. If there are faults in the books, they are forgivable ones. Often, Gamache is just too wise and saintly and Reine-Marie, his wife, is too much the perfect mate. There is no bad food. You could say the books have become formulaic. But it is a formula that I enjoy nestling up with. When I curl up with the next book, in my imagination it will be snowing softly outside—the kind of big fluffy snowflakes that fall in a Quebec winter, making the world a frosty, magical place. Inside, there will be wine and good food, a fireplace, and friends chatting and wisecracking. And of course there will be a frisson of danger, since there may be a murderer lurking out there. Rani Arbo & daisy mayhem playing at St. James Hall in Vancouver. These are great musicians but it’s hard to describe their music: basically roots but with lots of other influences mixed in. They combine all kinds of folk traditions.The band describes their style as agnostic gospel. 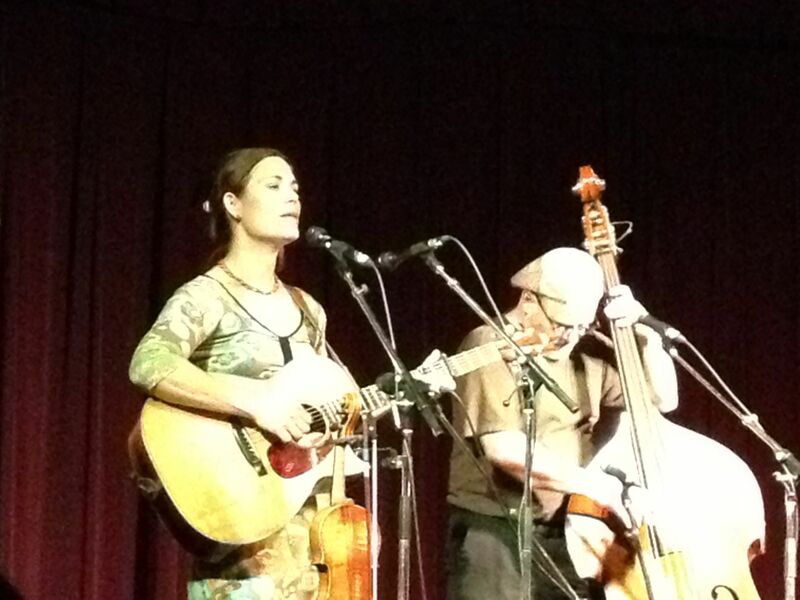 Rani Arbo sings and plays guitar and fiddle. The other members of the band play a variety of instruments, including a highly effective percussion set created from objects such as a suitcase and tin cans. 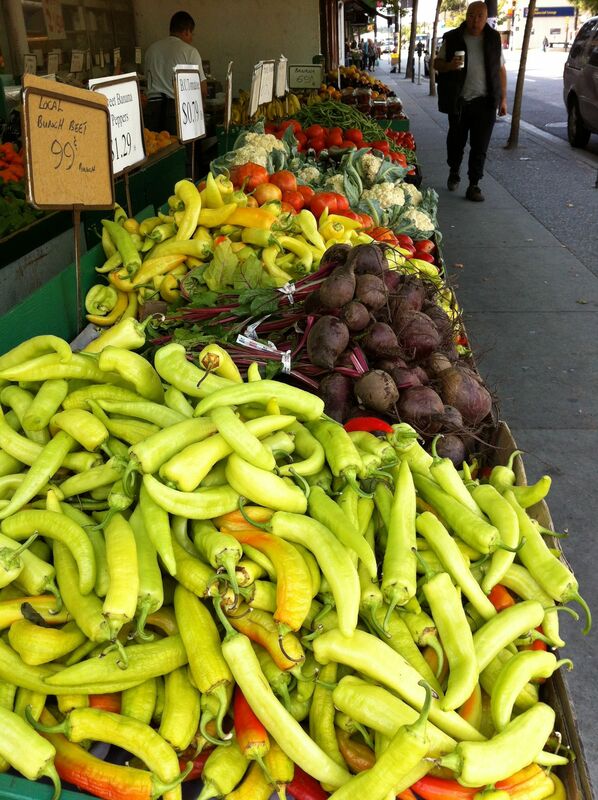 It’s hard to resist taking photos of produce stalls. This one is on Commercial Drive in Vancouver. 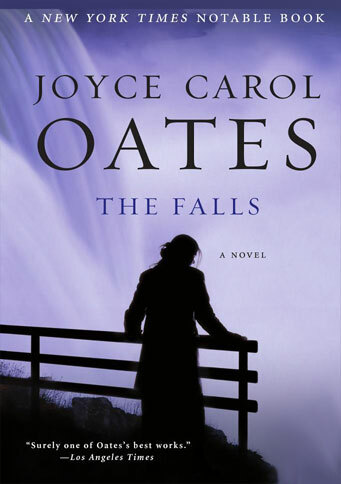 The Falls, by Joyce Carol Oates. I had not read any Joyce Carol Oates for years, so it was a delight to find this book. The world she describes is realistic but comes from a fresh perspective. Her people are original creations. There are flaws, but never enough to take away from the overall accomplishment. Newly married Ariah Erskine wakes in her Niagara Falls honeymoon bed to discover her husband of one day missing. She carries on a vigil for a week, becoming known as the Widow Bride of the Falls. But eventually Gilbert’s body is found and she has to accept his death. Ariah changes over the time period of the book, which runs from 1950 to 1978. At the beginning, she is a shy, awkward music teacher in her late 20s, the daughter of the Reverend Littrell. She agrees to marry Gilbert largely out of a desire to relinquish spinsterhood. After she is widowed, she remarries and discovers a sensual, passionate side to her nature. She is blissfully happy with her husband and children. But her early fears and superstitions are always there in the background: she knows that one day this second husband will also leave her. In the third phase of Ariah’s life, painful experiences cause her to retreat from the world. She goes to great lengths to keep her family away from outside harm. Although we see a lot of the unfolding story from her perspective, we are aware that she often sees only what she wants to see. She never examines her own behaviour critically. Some chapters are written from other points of view and they help round out the picture. Ariah is the most intriguing person in the book, though perhaps not a particularly likeable one. Her three children are all initially hindered by their mother’s fierce, smothering love, but they all eventually find their way around her into their own lives. The story of Ariah and her family would stand on its own. But there is a whole second story woven into The Falls—that of Love Canal, based on fact. In the sixties, the area around Niagara Falls became known for its concentration of chemical factories. Carelessness about disposing of toxic waste (if not outright criminal negligence) caused a spike in miscarriages, birth defects, cancers and more in the population living in the area that became known as Love Canal. Initially, residents’ concerns were met with resistance and denial but, eventually, after reporters began to investigate and public attention focused on the situation, there was a major court case and a settlement. The US government declared a federal health emergency in 1978. Residents were relocated and received compensation. In The Falls, Ariah’s second husband, lawyer Dirk Burnaby, takes on the case in the late sixties—but he loses as a result of coverups and corruption and his career is destroyed. Joyce Carol Oates’ fictional characters work well in this slightly altered universe and the history of Love Canal is a compelling, if depressing, part of recent history. 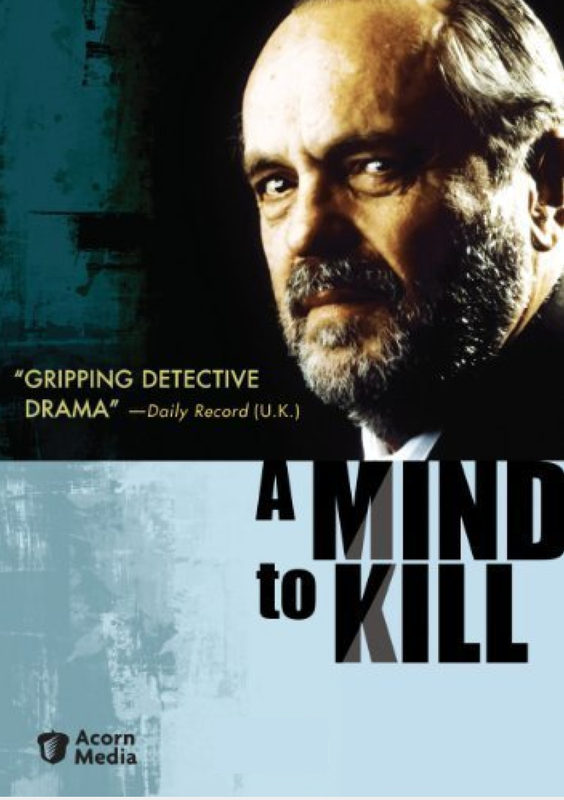 A Mind to Kill is a television series made in Wales and filmed in both Welsh and English. Philip Madoc is Detective Chief Inspector Noel Bain. Having been born in Wales definitely added to my enjoyment of this series. The accents, the often bleak landscapes of small towns, the familiar colloquialisms, all added to an experience of—well, not quite nostalgia but something related. The series is set in the 1990s, but there is something about small Welsh towns that takes you back in time; attitudes and social mores don’t change as fast as they do in cities. Bain, a widower, has an on-again, off-again relationship with the pathologist, Margaret Edwards (Sharon Morgan). He has a loving but strained relationship with his daughter Hannah. The feel of the series is oddly uneven; there are some episodes clearly written and directed by different people. But the supporting cast is strong: Gillian Elisa and Geraint Lewis are very good as detectives and Sharon Morgan is well cast as Bain’s independent and acerbic love interest. Lunch on the patio. 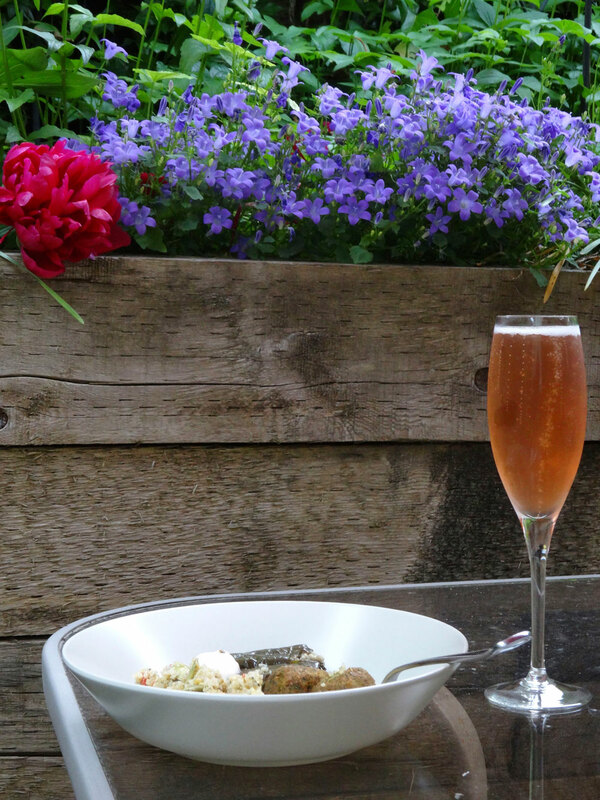 Eating outside is one of the great pleasures of early summer. Various things from the Greek section of the deli taste so good in the open air. I should really have been drinking retsina, but it’s hard to resist the charm of something sparkling and pink. 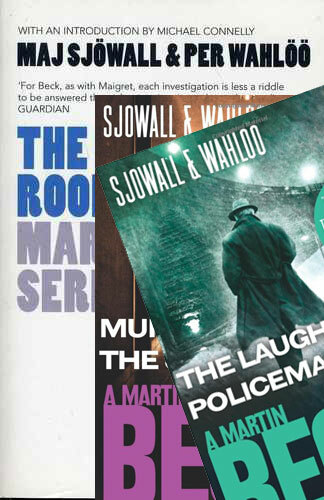 I’m reading through the mystery novels of Maj Sjöwall and Per Wahlöö, set in Sweden and written between 1965 and 1975. The earlier ones are a bit dated (the term “nymphomaniac” now seems dredged up from antiquity) and the authors’ Marxist beliefs are sometimes editorially inserted without sublety. But the books are fundamentally very well-written police procedurals. Ahead of their time in terms of gritty realism when first released, they are still well worth reading today. The novels’ Detective Martin Beck (later promoted to Inspector) is an early version of a now classic character: a decent, driven, homicide investigator whose private life is sacrificed to his job. At the beginning, he is married with two young children. Later in the novels, he divorces and has a turbulent but essentially loving relationship with his grown daughter. Yes—Beck was around before Ian Rankin’s John Rebus or Henning Mankell’s Kurt Wallender. Beck leads a team of colleagues who are all well-drawn and believable, complete with individual quirks and flaws. … It wasn’t hard to see that something had to be done. As early as May, the Canal Company requisitioned a dredging machine from the Engineering Board. The papers were passed from one perplexed civil servant to another and finally remitted to the Swedish National Shipping and Navigation Administration. The Shipping and Navigation Administration thought that the work should be done by one of the Civil Engineering Board’s bucket dredging machines. But the Civil Engineering Board found that the Shipping and Navigation Administration had control over bucket dredging machines and in desperation made an appeal to the Harbor Commission in Norrköping, which immediately returned the papers to the Shipping and Navigation Administration, which remitted them to the Civil Engineering Board, at which point someone picked up the telephone and dialed an engineer who knew all about bucket dredging machines. Sjöwall and Wahlöö were a smart, politically aware couple who decided to write ten books in ten years. They wrote alternating chapters. And their plan was that the books would hold up a mirror to the problem of increasing violence in Swedish society—a reflection and a warning. Their novels succeeded in gaining an audience in a small way at first and in increasing numbers over the decades since. Whether anyone heeded their warnings about the worsening social problems is hard to say. Here is another period piece: this one from England, a decade later. 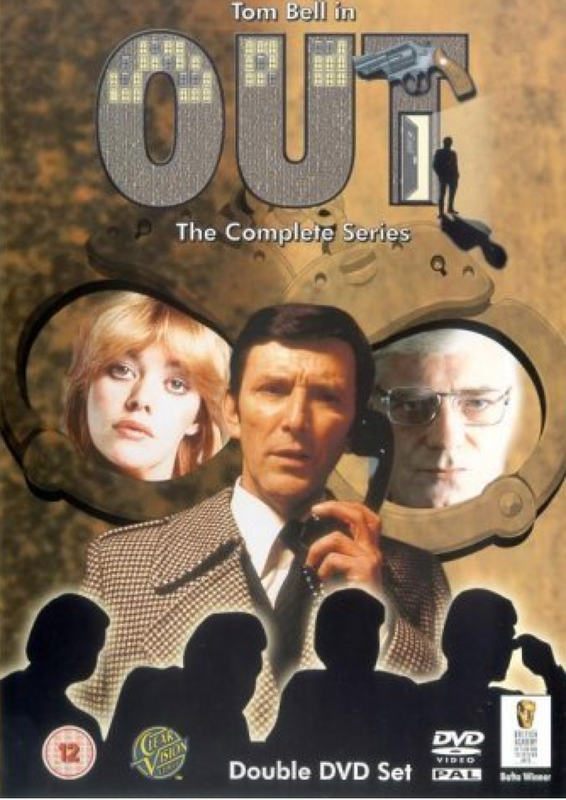 The six-episode television series Out was made in 1978. Frank Ross (Tom Bell) is out of prison after an eight-year sentence and is looking for the person who grassed on him. The clothing and hair styles can only be described as wonderfully seventies. The dialogue can be hard to follow, as it’s full of the jargon of the era used by people who make their living through crime, ranging from petty to significant, and who survive by their street smarts. You can follow the meaning of conversations by the context, though it makes you realize how fast language changes and how difficult it can be to understand subcultures. Outside of the gang and associates, Detective Inspector Bryce (Norman Rodway) is waiting until Frank makes a mistake, so that he can put him back inside. But the viewer’s sympathies are with Frank, if with anyone—we’re not sure that Bryce’s motives are pure. Women are relegated to secondary roles. It is a man’s world where male activities are the important ones, leaving the women to wait around and accept offhand treatment. Frank’s lover Anne (Lynn Farleigh) is an unsatisfactory character who appears to have no life independent of a man and there is no obvious chemistry between her and Frank, even in the sort-of-love-scenes. Frank’s wife Eve (Victoria Fairbrother) is mentally ill and is in a home. It’s not clear what this adds to the story, other than some unresolved complexity. Watch this for the late seventies feel and the awareness of moral grey areas, less common when this series was made. Dessert at Cotto: Lemon Pannacotta. 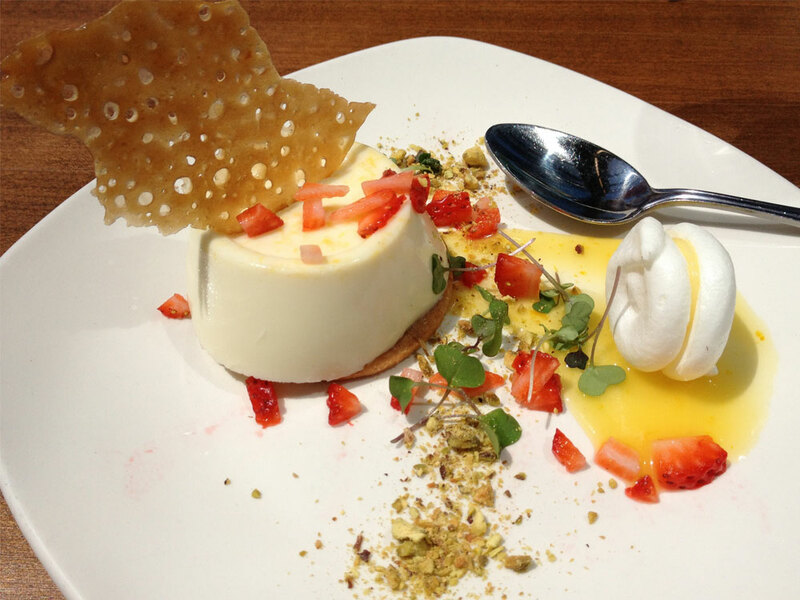 A work of art on the plate, with a variety of textures on the palate—the smooth tartness of the pannacotta, the yielding crunch of the pistachios, the shattering crunch of the thin butterscotch cookie shard, the melt-in-the-month meringue with a lemon cream filling. And more! This is many desserts in one.